Visteon Corp. builds the versatile center console inside the new Renault Scenic and Grand Scenic minivans. The console can be moved forward or backward while the armrest on top of the console can be moved independently, too. The console has two interior storage compartments. The larger can hold a 1.5-liter bottle while the second compartment, which fits inside the larger one, can be used to store small items. The U.S. supplier also provided the center console in the previous-generation Scenic and Grand Scenic. Visteon produces the part at its plant in Gondecourt, northern France. Much of the original assembly line equipment was re-used for the new design, thereby reducing tooling costs. NSK Ltd. provides the minivans' electric power steering, which is standard equipment. The system eliminates the need for hydraulic fluid and the associated problems of leakage, saving an automaker about 190,000 liters of hydraulic fluid per 100,000 vehicles manufactured. Furthermore, electric power steering is more efficient because the system only engages when assistance is required, reducing fuel consumption and CO2 emissions. NSK produces its electric power steering at its plant in Walbrzych, Poland. TRW Automotive Inc. provides steering gears to the system. 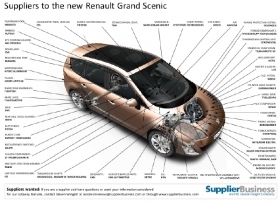 Renault assembles the Scenic and Grand Scenic at its factory in Douai, northern France. The Grand Scenic went on sale in April with prices starting at €20,400 in its home market. The Scenic went on sale in June, retailing at €19,900. The Scenic is credited with creating Europe's minivan segment. It was an instant sales hit following its debut at the 1996 Geneva auto show. The larger Grand Scenic first arrived in 2004.